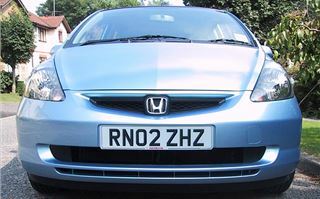 The Honda Jazz is Japanese Car of the Year. It is the best-selling car in Japan, finding 20,000 new owners every month and 36,000 more on the waiting list. 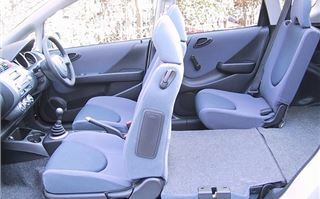 Its interior puts it ahead of the entire crop of new small cars, including those that haven’t even been launched yet. It beats everything else on versatility, economy, specification and price. Just like the Model T Ford in 1909 and the Mini in 1959, it's the right car at the right time. So how did Honda move the goalposts and wrong-foot everyone else? The first thing they did was move the petrol tank. Instead of putting it under the back seats, they put it under the front seats. That enabled them to scoop much more interior space out of the floorpan. And, with an average five-year model cycle, it isn't something anyone else can catch up with until they design their next car from scratch. Honda didn’t stop there. 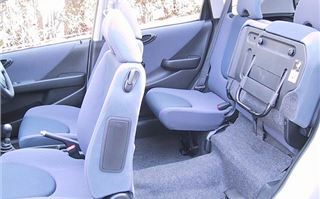 They also thought very hard about exactly how they were going to use all that space, and came up with a concept so clever they call it 'Magic Seats'. Where with an ordinary car you can break your fingernails and give yourself a hernia rearranging the seats to carry something, with the Jazz all you do is press a button on the front seat back, then flop down the rear seat, headrest and all, in one simple movement. 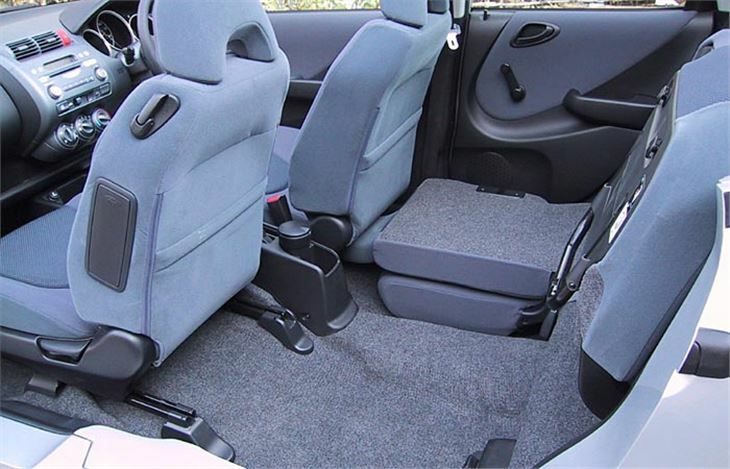 Flop down both seats and you create a cavern in the back with a perfectly flat floor. But that's only the start, because Honda has another trick up their sleeve. 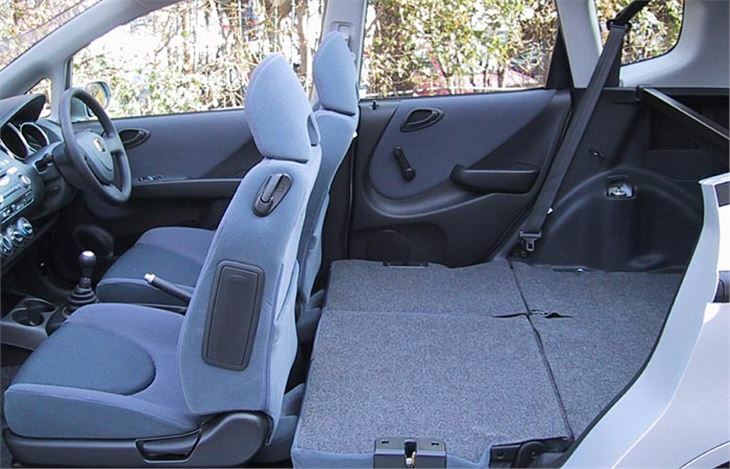 Lift the rear seat squabs and you create an entirely different type of luggage space, bang in the centre of the car. Somewhere to put something tall and awkward, like a house-plant, or a bicycle, or a wolfhound. To fold it back again, just pull out the legs and drop it down. Either side or both sides. It's that easy. More to the point, its exactly what I want and what you want. 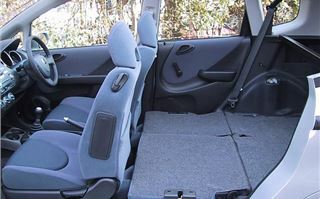 With the Magic Seat system, Honda has left every other manufacturer scratching their heads. As if that wasn't enough, Honda has also come up with an entirely new chain-cam engine for the car. Called i-DSI, it uses two valves and two spark plugs per cylinder to provide a combination of low speed torque, performance and economy that no one else can match either. 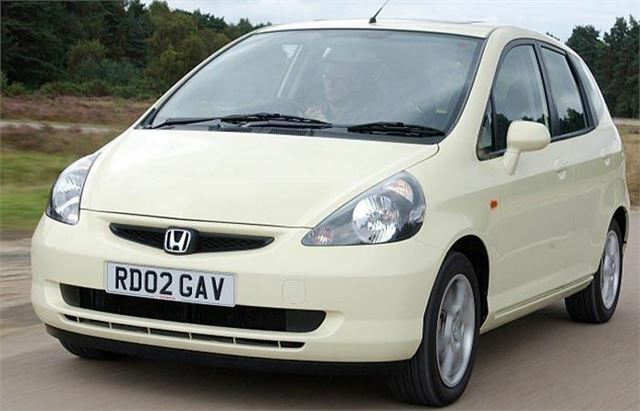 Just look at the figures: zero to sixty in 11.7 seconds, top speed 106 mph and a combined economy figure of 49.6mpg. Even the urban figure is nearly 41mpg and on a run nearly 60mpg is possible. Naturally enough, this gives the car a low CO2 output of 134g/km which will keep it in the lowest VED class of £100 pa for years to come, and also makes it a very sensible choice for company car drivers. On top of that, insurance is in a rock-bottom Group 3E. 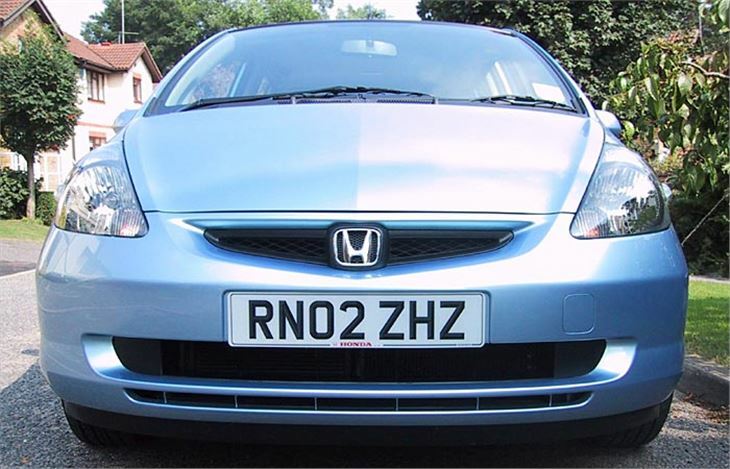 And, oh yes, the starter price is just £8,995 on the road with a three-year 80,000-mile warranty. For that sort of money, Ford hopes to get you into a 5-door Fiesta with a 1.3 litre engine that dates from the 1970s. So what's this paragon of virtues like to drive? The seats are comfortable. It has a snicky, neat and positive gearshift. There are useful trays, cubbies and cupholders everywhere to hold all your bits and pieces. The steering is light without being too light. The ride is a bit stiff. The gearing is a tad short for the motorway. And the handling is, to use a weaselly word, 'assured'. Just don't expect bagfuls of fun. Okay, if it was a hoot to drive, every other manufacturer would have no choice but to wander off into the sunset and shoot themselves. I would guess that the new SEAT Ibiza is going to run away with the 'fun fun fun' accolade. (The new Fiesta certainly hasn't.) But the Jazz plays a different tune. It does the job. It's neat, tidy and safe. (Honda is expecting a four-star NCAP crash safety score, by the way.) But it's no boy racer.